A Team Van Oord flood protection project covering an area of outstanding natural beauty within the Severn Estuary has won the top accolade in a prestigious national awards scheme. 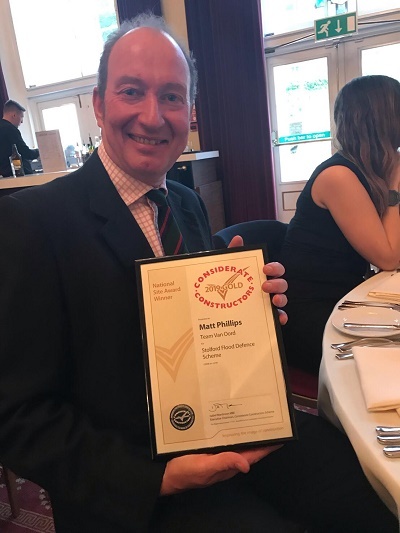 The Stolford Flood Defence Scheme, completed in 2018, received a Gold Award in the 2019 Considerate Constructors Scheme (CCS) National Site Awards, which were presented on 4 April. The Stolfold scheme – carried out by Kier and Royal HaskoningDHV, working as part of Team Van Oord and on behalf of the Environment Agency – featured the innovative Hillblock block flood protection system. The Considerate Constructors Scheme (CCS) was founded in 1997 by the construction industry to improve its image. Construction sites, companies and suppliers voluntarily register with the Scheme and agree to abide by its Code of Considerate Practice which focuses on three main categories: the general public, the workforce and the environment. The CCS National Site Awards recognise construction sites where exceptional standards of consideration are shown towards local neighbourhoods and the general public, the workforce and the environment. Winning a National Site Award is an exceptional achievement only given to sites that have made the greatest contribution towards improving the image of construction. Only the top scoring registered sites are potentially eligible to win a Bronze, Silver or Gold award – and a Gold award was presented to the Stolford project team at a ceremony in London on 4 April. The tiny coastal community of Stolford on the Somerset coast has become the first location in the UK to benefit from innovative flood defence technology pioneered in Holland. Overlooking the Bristol Channel, Stolford has a history of coastal erosion and is prone to flooding. In 1981 high tides overtopped sea defences and flooded 24 properties and 660 hectares of land, and killing livestock. In 1990 a high tide and storms caused further flooding. There are already coastal defences between Stolford and Hinkley comprising rock armour and an embankment wall. These defences adjoin a shingle ridge that was prone to serious erosion. Rising sea levels and more extreme weather conditions have made the ridge and embankment increasingly vulnerable to erosion and increased the risk of a breach. The Environment Agency previously spent £50,000 a year replenishing the ridge with 15,000 tonnes of shingle. Conventional rock armour, also known as rock revetment, would have been too costly and visually intrusive. In addition, the transportation of rock armour would have caused excessive disturbance from heavy lorries travelling in narrow lanes to a remote coastal location. It was decided the best solution was a Dutch system known as Hillblock, a type of block revetment that uses a series of specially-shaped concrete blocks. Storm waves flow over the structure and enter a network of cavities between the blocks that absorb wave energy. Shaped like champagne corks, the blocks are made from high density concrete and held in place by steel piles and concrete kerbs. Although extremely heavy, each block is designed to move slightly. The technology has been used extensively in coastal defences in Holland. The Hillblock system significantly reduces wave run-up which means the height of the defences can be reduced compared to conventional systems, hence reducing the quantity of construction material required, costs and carbon dioxide. The Stolford scheme will provide a higher standard of flood protection to 20 properties, the village access road and approximately 70 hectares of agricultural land. Opening the scheme on 18 March, John Curtin, Executive Director of Flood and Coastal Risk Management at the Environment Agency, said: “This is an exciting engineering first for UK – the new technology installed at Stolford can reduce wave energy by up to 30% compared to the shore protection traditionally used. It will provide valuable protection to this Somerset community and the surrounding agricultural land.